1) E36 M3, M Coupe, and M Roadster (S52 and S54) FRONT parts will only fit with the ///M spec spindles on all E36 318, 323, 325, 328 models. 2) The only upgrade for the rear of the 318ti is by swapping in the entire rear of a M Coupe or M Roadster (spendy). -Understeer (Chris) made a statement that *all* E36 SS line kits should fit the same cars (6 piece kits), but I find it interesting that Turner Motorsport lists a separate 318ti category. Supposedly all E36 rear 4 line kits have the same part numbers. Anyways, the following are some of the popular kits available for our cars. -The thickness of the rotor is the same for the 286mm and the 300mm as well as the breaking surface. Same braking surface of the 286mm solid which means same pads as the 318ti. The only difference between the 286mm vented and the 300mm vented setup is the carrirer: on the 300mm the carrier is larger and relocate the caliper 7mm outer. Credit to "lpcapital" from 318ti.org for helpful added notes. Thanks bud. Awesome write-up, very good info. Can we sticky this? Also, may I suggest listing the wheel sizes needed to clear the different brake upgrades? E46 M3 rotors fit the same size hubs/spindles as the E46 non-M cars. So the E46 M3 rotors fit without any modification needed. You would need a custom brackets to make M3 calipers fit. The UUC Wilwood brake kit for E36 cars uses E46 M3 rotors. 5) I think that no rear brakes are compatible with the 318ti/Z3 hub; you can swap in the ///M roadster/coupe rotors, but it requires replacing the wheel hub; I was told, but never confirmed, that E46 rear bares would fit if the parking brake shoes are removed (I can't confirm nor deny this). 8) If I may suggest, I would actually reverse the chart in the sense of putting the rotor size as title and the compatible models below. I know there is something on these lines written up somewhere. bf.c? Yeah, that is what I meant by "won't fit." Size isn't the issue, it's the "custom" part. And thanks for the sticky Steven, I hope this helps some others out. Thank you for the detailed input. 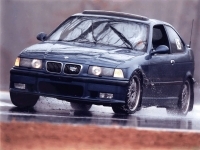 I will add that the E46 323 sedan has the smaller brakes vs the coupe/convert. As far as wheel size, I wonder if a 15" wheel would fit under a E46 325 300 mm rotor? Didn't 15" come stock or was that just in the early E46 base sedans? 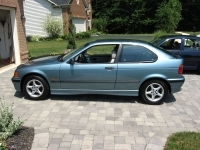 To be safe, for sure use 17's with any E36 M3, M coupe, M roady, 330 front brake upgrade. *Some* 16's fit, but it's not worth the effort imo. So the E46 325 with the 300 mm vented has the exact same caliper as all E36 325/328 models? Good info. I am currently looking at a great condition used set of E46 325 calipers/carriers for under $100. I assume I will just order the 300 mm vented E46 blanks for front rotors. By assume, I mean I doubt the 286 mm vented fit right? EDIT: It seems the 323ci coupes do not use the 300 mm larger front rotors. The only 323 E46 models to do so are the convertible and the touring. EDIT(2): I took your advice and totally redid the chart. This has taken me some time, so I hope all of you get some use out of it. As far as wheel size, I wonder if a 15" wheel would fit under a E46 325 300 mm rotor? Didn't 15" come stock or was that just in the early E46 base sedans? Not on 300mm. I know that the Z3 3.0i with 300mm front rotors has a 16" spare tire as opposed to the traditional 15" of all the other Z3. I actually tried to rescue a friend with a flat on his Z4 3.0i with 294mm rear rotors and the caliper was rubbing against the rim (I had to run on the donut and give him one of my 16"). Same with all E46: they have a 16" spare. The 323i sedan is the only one that lists 15" as alloy or spare rim. So the E46 325 with the 300 mm vented has the exact same caliper as all E36 325/328 models? Good info. Yes: the thickness of the rotor is the same for the 286mm and the 300mm as well as the breaking surface. Same braking surface of the 286mm solid which means same pads as the 318ti. The only difference between the 286mm vented and the 300mm vented setup is the carrirer: on the 300mm the carrier is larger and relocate the caliper 7mm outer. I am currently looking at a great condition used set of E46 325 calipers/carriers for under $100. I assume I will just order the 300 mm vented E46 blanks for front rotors. By assume, I mean I doubt the 286 mm vented fit right? 286mm won't fit if you're using the 300mm carrier. I would actually recommend using the Z3 3.0i rotors as the front wheel hub of the Z3 is the same of the 318ti. They will fit for sure. E46 rotors might not fit... But I never tried it; I came to this conclusion by comparing parts number on RealOEM; I'm not sure if it's just a BMW thing or also aftermarket rotors are different. You're right, I was looking at the wrong printout. On day I would like to remove the rear brakes from the Z4 and see how they fit on the Z3. I'm just curious to see if there's any way to make it work. Thanks again for more info lpcapital, I referenced you in the thread. I just added front brake pad info, will do rears tomorrow. It is pretty cool to know how many models of front/rear pads work for our little ti's. Opens up the market for buying good pads tenfold. Just thought I'd throw in my observations.. I'm running the vented 300mm E46 325i Calipers/Carriers. I bought standard E46 325i rotors and they fit just fine. I run 16" E36 Sport Package wheels and there's about 3/16" of clearance, so if you go that route kiss cheap 15" tires goodbye. ^ Thank you for your input. Will an e46 16" spare fit under a 96 ti? I am getting ready to put the 300mm rotor setup on my 96 Sport and I am wondering if the 16" spare wheel/tire from an e46 325/328 will fit the spare tire tray/mount under my car? My 15" tire is shot anyway. Use bead adhesive (Tire shops that do tractor tires should have it). Mount the tire up using the adhesive and pump it up and let sit over night. Deflate the tire and it will "mush" into the spare tire tray. Carry a can of compressed air to fill it up when needed. I'm pretty sure the spindles on the ti didn't change over the production run, so the list above answers your question. Any of the E36 front calipers, except the M3, should bolt right up to the ti spindles. You'll obviously need the vented rotors but that should be it.